It was a cold, cold night in Hotel Lobesa. 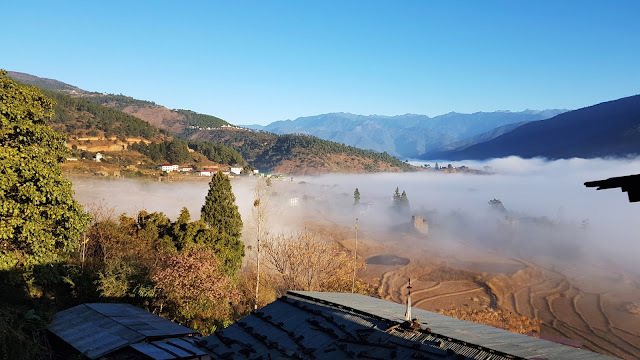 But the cheerful morning sunshine had warmed our hearts as it shoved the cold morning fog away from Punakha valley. This was the breath-taking view from our hotel room and we wished we didn't have to leave. Getting ready for breakfast at Hotel Lobesa's beautiful dining hall. Everyone at Hotel Lobesa was fantastic. Service was impeccable. And the owner of the hotel was behind the counter to see every guest out with a big smile. Saying goodbye to this small but heart warming hotel. Loading our luggage into the vehicle with our driver Mr. Sangye lending a hand. Another long road journey ahead with quite a distance to cover today. We had to get back to Paro by sunset, via Dochula Pass and the capital Thimphu. After slightly more than an hour of bumpy road journey, we got back to Dochula Pass to have our tea and biscuits, and sharing our biscuits with our best friends. Happy dogs waiting patiently for their biscuits. These would need no introduction if you have read my Day 3 post. Dochula Pass (and the 108 memorial Chortens) is an inevitable stopover between Thimphu and Punakha. 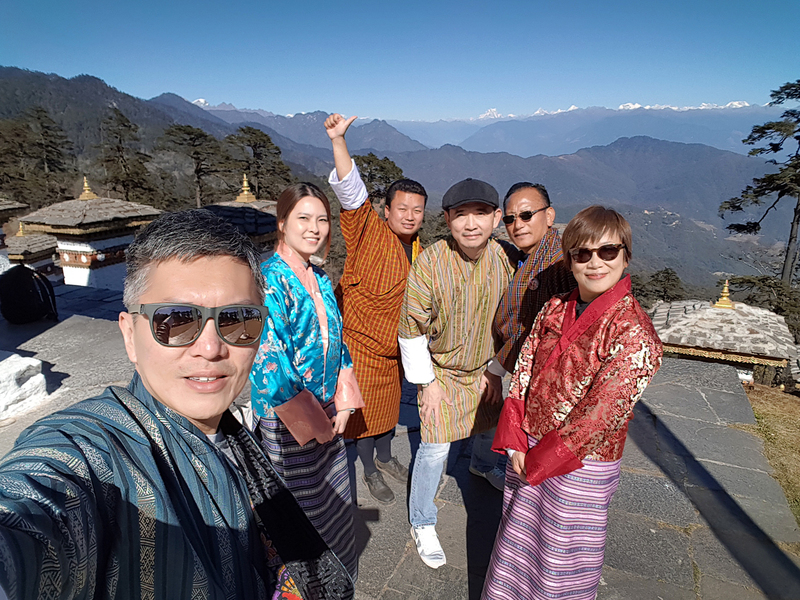 All dressed up in Bhutan's traditional clothing today and enjoying the amazing views of the Himalayan mountain range. A must-have wefie at Dochula Pass with our amusing tour guide, Mr. Jigme (third from left) and driver, Mr. Sangye (second from right). Both Mr. Jigme and Mr. Sangye teaching us their traditional song and dance. Dochula Pass - quite precisely at 3,100 metres above sea level. Fragrant dried chilli, something we see in every meal and can't do without. Ground dried red chilli powder. A must-have in Bhutanese kitchens. It's not all work. Children playing and entertaining themselves at a market's stall. Fragrant incense powder. Don't be mistaken, they are not curry powder and don't start tasting them. A wide variety of incense at the market. It is the largest domestic market for farmers in Bhutan, and has everything that a local home would need. Completed in 2008, this 2 storey building is open only from Friday to Sunday every week. This extremely sweet and adorable child was quite fascinated by me and my camera (and possibly me in my Gho outfit). Directly opposite the Centenary Farmers' Market is a small outdoor bazaar which sells local apparels, wares, and some souvenirs. Just take this wooden bridge across the river and the bazaar is just ahead. A less fortunate individual begging on the bridge. It's rather uncommon to see beggars in the country. Our tour guide, Mr. Jigme, sitting at a Kira store and getting on to his social media while waiting for us to satisfy our shopping desires. Richly textured and colourful fabric, finely crafted and polished home ware. Bargaining at the shops with the help of our tour guide. To be honest, the shop owners remained so cheerful after all the haggling, or even if we didn't buy from them in the end. Even passer-by would join in the fun. These lovable children were playing around me and posing for photos. 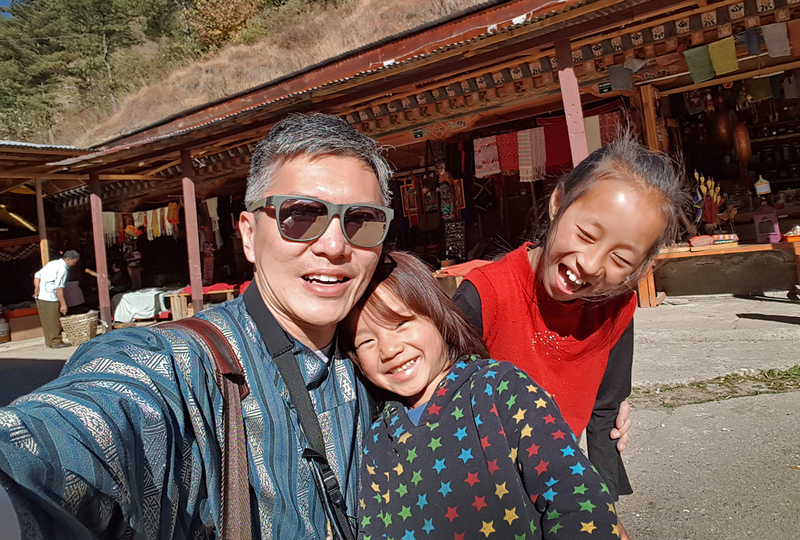 Children in Bhutan are incredibly dear and adorable. The two joyous and delightful girls having fun with my camera and were more than happy to pose for a wefie. 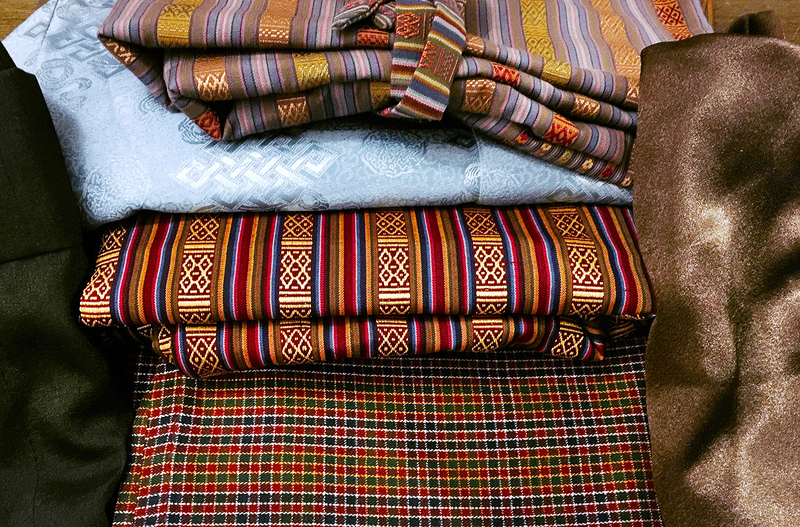 Bought a few sets of traditional Bhutanese clothing after some dramatic and fun bargaining. Walking back across the bridge decorated with the same prayer flags of blue, white, red, green and yellow fluttering in the cool valley breeze. Our next stop was the Gagyel Lhundrup Weaving Centre. It was amazing to watch the skilful lady weave together the tapestry, thread by thread, millimetre by millimetre. No automation, no machines, no technology. Keeping the art, culture, heritage and skills alive. A jaw-dropping collection of apparel, accessories and ladies' Kira - an ankle-length traditional dress consisting of a rectangular piece of woven fabric. Those in pure silk could start anywhere from USD2,000 to USD5,000 a piece. There were more exquisite ones in the glass showcase which we didn't ask further. And this weaving centre had also proudly made a Rachu (ladies' draped-over scarf) for Queen Jetsun Pema. It was late lunch for us today, inevitably after a long day of shopping from the market to the bazaar and finally, the weaving centre. As usual, the restaurant was clean and nice, with great service and fantastic Bhutanese food. A friendly couple manning a tiny provision store below the restaurant. Slowly but surely, the influence of western culture is starting to creep in. It took us slightly more than an hour to travel from Thimphu to Paro. After such a fulfilling day of marketing and shopping, we decided to check-in our hotel and call it a day. And at 4.30pm, the sky was starting to turn dark. Our hotel Tashi Namgay sits on a sprawling ground with individual blocks sparsely scattered. Perfect place for some peace and tranquillity. Hotel Tashi Namgay sits at the edge of Paro Chhu river. Pavilions, common spaces and the spa facilities front the mesmerising waterway. Across the other side of the river lies the Paro International Airport. The grand lobby of Hotel Tashi Namgay, with the reception on first storey and the restaurant on the second storey. Admiring what we've gotten today with our little bit of marketing and bargaining - several sets of Gho and Kira to bring Bhutan home.